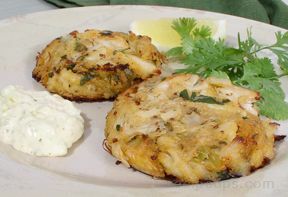 This recipe is an excellent source of protein, niacin, vitaminB6, vitaminB12, selenium and zinc; and a good source of iron. The combination of tomatoes with hash browns creates a tasty, filling meal. 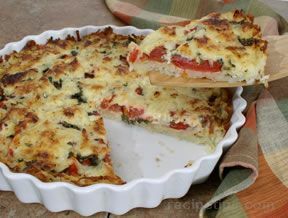 This vegetable based quiche makes a tasty recipe for vegetarians. It is also a great dish in which to use your fresh garden tomatoes. Learn All About Tomatoes in our Tips and Advice. This baked turkey recipe is perfect for the holidays. 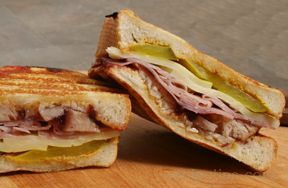 Baking a turkey is just one of the many methods for cooking turkey. 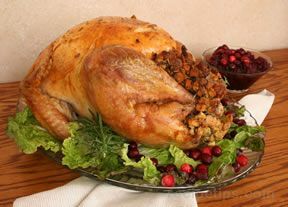 See our Turkey Cooking Guide to learn how to cook a turkey using other methods. Check out our Turkey Cooking Times for perfectly done turkey. Soup that tastes like you worked on it all day but actually ready in less than an hour. Serve this soup with soda crackers and peanut butter sandwiches. 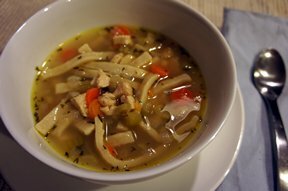 The frozen egg noodles are as close to homemade as you'll find and work perfectly in this soup. 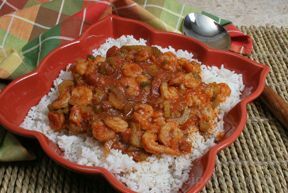 This Louisiana style dish, served on a bed of rice, is a lively, flavorful way to prepare shrimp.